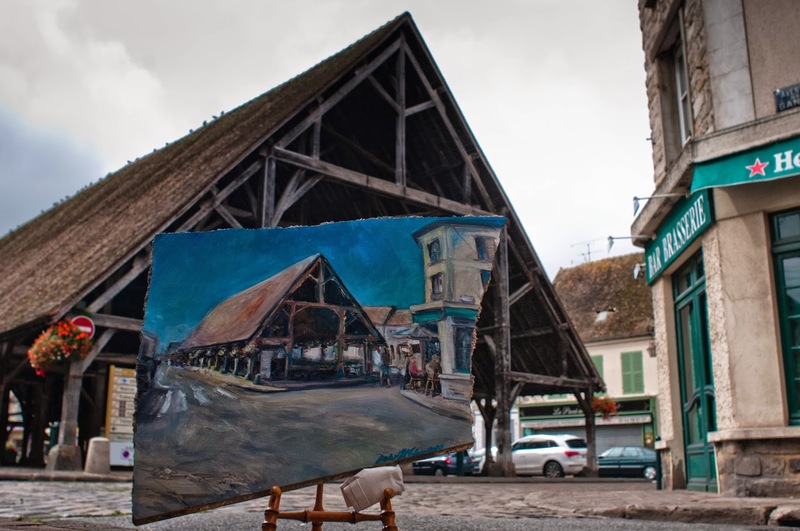 Lost Art wraps up its summer in the French countryside this week with a painting of the local marketplace in the town of Milly-la-Forêt. While we've been staying out in the country this month, Milly is where I've gone every morning for bread and newspapers, and where I've done whatever shopping needed to be done for the house we're watching. I will always carry fond memories of this town, and I was very happy to find an Avenue in it that's named after the family we've been staying with! So I decided that it would be nice to do a painting on that street, overlooking the market. Luckily I was able to find a scrap of old particle board nearby! It's been a rainy few weeks, so I haven't been able to do quite as much painting as I might have liked, but I hope that I'll get to return here next summer and do a few more. And hopefully someone will find this one before it starts raining again! For now, I hope you're all having a great end-of-summer. I'm back to Paris tomorrow and will see if I can get one more painting in before leaving next week for Egypt. As always, I'll keep you posted! 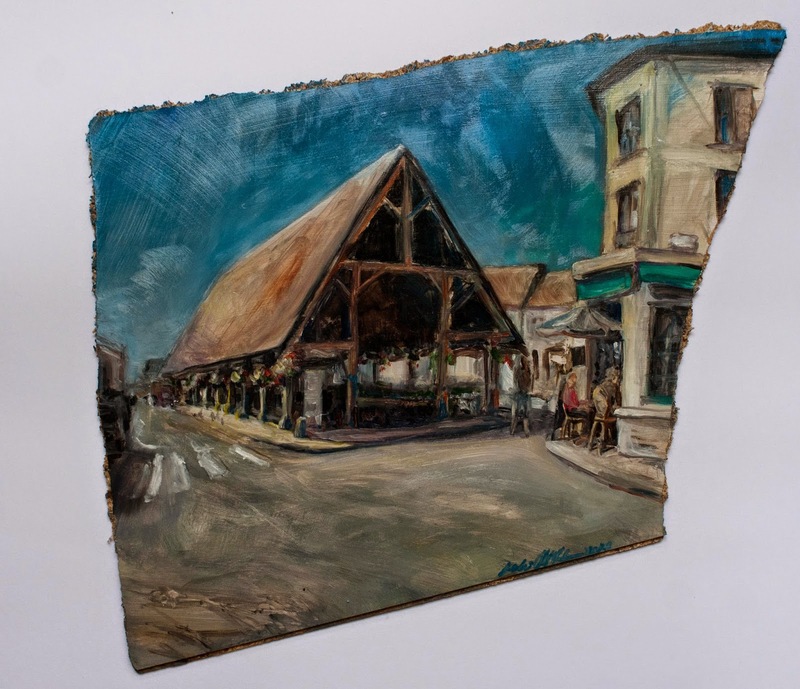 This painting, oil on found particle board, roughly 48 cm x 37 cm, was left on the Avenue de Ganay, overlooking the Place du Marché in Milly-la-Forêt, France on August 27th, 2014 at 12pm. Although I have lived in the USA since 1967 and like it here, Milly La Foret where I was born and where I grew up is in my heart forever. I love the painting you made on the old particle board and hope that someone found it, before the rain! Perhaps next summer will I find one of your paintings in the streets of Milly! Thank you so very much! I heard from the people at the Milly tourism site that someone had taken it, but we don't yet know who. Hopefully they'll come leave a comment here! Do you come back to Milly every summer? I would love to paint there some more next year. We have some friends we like to visit who live quite nearby. I'm so glad you liked the painting, and I would love it if you would find the next one next year. Thanks for writing! I love this. Years ago I would leave (fairly large) paintings in those lovely glass telephone booths all over Paris. Sometimes I left them on bridges. Sometimes in bars. Bon voyage! That's terrific! Did you leave any way for people to contact you if they found them? Or just leave them anonymously? I went back and forth about that and eventually decided to start the blog in case people wanted to get in touch. But so far, only a few people have.